As global events shape our future, top management students from India increasingly want a slice of the global experience. Student Exchange programmes during the second year of your business school offer that window to a world beyond India. A 4 month student exchange programme can turn out to be a life-changing experience in the same way a rural immersion stint can. Different language, culture, attitudes, ways of living and completely different approach to learning can make you uncomfortable as well as make you wonder in amazement. However, very little is spoken about these things outside the confines of a business school campus in India. In a series of reports we now try to delve deep into the various factors that shape the student exchange programmes at top business schools in India. In our first report, we look at the numbers that add it all up. This will give you a slice of the state of student exchange programmes in top schools in India. As an aspirant who wishes to go to a business school, may want to look at this report if he/she is extremely keen on a global academic experience. It is a primer on student exchange programmes at business schools in India. Only 7 of the business schools that we cover on this website have more than 10 partner universities where full-time exchange options are available. And we have additionally looked at ISB Hyderabad which has arguably the best quality exchange programme options. We have also looked at the number of options available and the diversity of the options in terms of geography. * IIM Bangalore – additionally outgoing 58 for international collaborative programmes, 46 incoming for the same. **IIM Bangalore – only shared a partial list of 38 universities. Hence, we could only check the rankings for those. *** ISB Hyderabad – Data as per website. Email unanswered. Regional Diversity : You will notice that maximum number of partner universities are in Europe and that is because technically PGDM at IIMs and XLRI are considered equivalent of Msc. in Management and not a MBA degree. For all practical purposes PGDM in an IIM/XLRI/JBIMS is MBA in India but its a concept difficult to explain abroad. However, we are already seeing a shift here too with IIM A now being featured in the Financial Times Full-Time MBA ranking. Also, IIM A and B now have a sizable number of ivey league MBA schools and other top global MBA schools. IIM Ahmedabad: The student exchange programme of IIM A is extremely vibrant, and it only reaffirms its iconic status among b-schools in India. The list of exchange partners is remarkable for the sheer number, geographical reach as well as quality of B-schools. There are several options across the world for as many as 100 students in this batch of 380+. The distinguishing feature of IIMA’s exchange programme is its partnership with several leading MBA programmes from the USA and Canada. 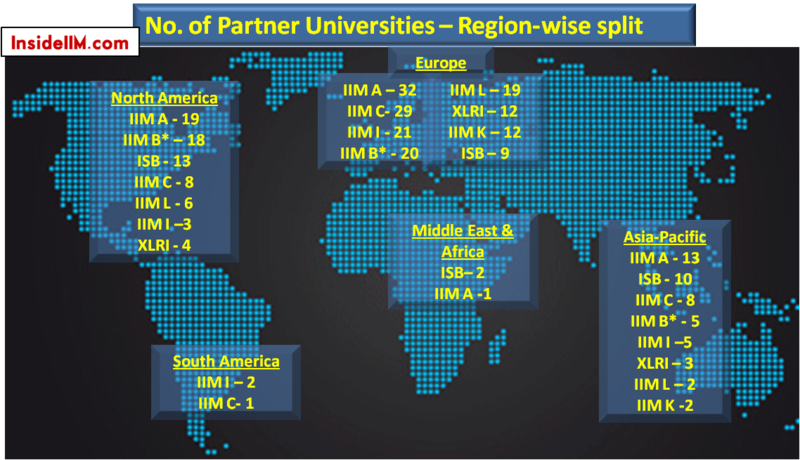 This gives IIMA (among the IIMs we’re analyzing) the greatest number of partners in FT Global MBA rankings. If one can attend 1 term at Columbia Business School at the fees of IIM Ahmedabad and study with that kind of diverse talent from around the globe, all we can say is wow! IIM Bangalore: Disclaimer: Incomplete data may distort our analysis. IIMB has 100 outgoing seats for exchange programmes, and additionally 58 seats for ‘international collaborative programmes.’ This gives IIM B the largest number of exchange partners across the world (100). IIM Bangalore has shared only an indicative list of 41 schools, but the list is one that can easily give IIMA a run for its money. London Business School is one of the toughest to get into and also one of the world’s most expensive programmes. Not that IIM Bangalore is any less, but what would you not give to study a term there in London! The schools below are in cities which do not yet have a global brand. Ahmedabad, Bangalore, Hyderabad and Kolkata are well-known cities globally and it is easier for foreign students to make a decision to study here due to better access to healthcare, connectivity and overall infrastructure. Also, of course IIMs ABC are much older and the IIMs themselves are brands recognized globally. ISB Hyderabad has been founded with the help of some of the best schools in the world. IIM Lucknow: A well-balanced programme offering looking at both quality of partner schools and regional distribution. IIM Lucknow has a double degree programme from next year onwards with ESCP-EAP, Paris. This is a great option and we are sure the seat will be intensely fought for. We just wish IIM Lucknow can send more people considering they have a batch size of over 400+. Considering IIM Lucknow is 25+ yrs old they ought to host more students as well! IIM Indore: Very robust programme offering purely from a numbers perspective. The b-school has done well in ensuring exchange opportunities are in tandem with the increasing batch size. They have moved quickly to put MOUs in place and are rapidly improving their student exchange programme even in terms of quality. There are some really good European schools in that list. Considering Indore is not a well-known name on a global level yet (Sehwag’s 200 might change that! ), attracting so many partners and hosting about 30 international students is very impressive. XLRI Jamshedpur: Considering no passenger airline air connectivity exists to Jamshedpur, it is a massive thing to be able to host close to 30 students. XLRI Jamshedpur has a great legacy and should ramp up its programme in the future. While there is always scope for more, 55 odd students getting an opportunity is a good number for a batch size of about 240. They have only 19 partners but some of them are globally renowned. For e.g. Darden. However, no double degree opportunity. IIM Kozhikode: IIM K has few partners but many of them are ranked quite well globally. There is no doubt that given the stature of the business school in India they need an overall ramp up. Considering their batch size is over 350+, 10% outbound opportunities are on the lower side. Also, like IIM Indore they need presence in the USA. Currently, they have no partners in the US or UK. No double degree opportunity. Wait for our next report! We would like to thank the Media Cells and Student Exchange Committees/International Offices of IIM ABCLIK, XLRI Jamshedpur for helping us build this story. We hope to receive continued co-operation from them in the future. 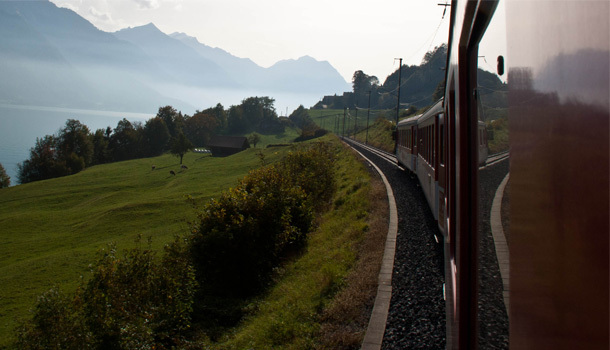 Student Exchange Dilemma – Should I go for it? a breadth of topics you guys cover…. very impressive content and presentation…. well done, keep it up! What amazing timing! Thanks guys! Including some information on approx. basic cost of exchange prog. and scholarships (and how it differs across continents) would be nice ..obviously it depends on univ. and how much you want to splurge, but an indicative comparison would be great for the next article. Further, I think MDI has an amazing line-up for exchange prog. as well…please see if that can be included as well.. I would like to point out an error. FMS is affliated to Delhi Univ and awards a proper MBA degree. IIM Indore's EPGP has an international immersion with Katz Business School, University of Pittsburgh, PA, USA. This university is not available in the list provided for IIM I. Very detailed and useful information! how does the selection of students for exchange programmes takes place?and for xlri is there information of the number of hr guys going for exchange as xlri-hr is considered best in asia-pacific? Student exchange criteria is CQPI + interest based. Students select their preference and as per their position in class they are selected. IN XLRI good amount of HR students go on exchange. As you will realize later, the purpose of exchange program is not solely academic, most HR students don't care if HR electives are offered or not, if they get into a good Bschool, they complete their credit requirements for specialization by taking more HR courses when they are back. I think MDI hasn't come under the ambit of insideiim's coverage of b-schools till now……. MDI has a tie up with around 80 partner universities. How many B-Schools in the country boast of such a strong and robust student exchange programme? "In terms of the number and quality of partners, we would rate IIM C definitely below A and B, and definitely above the other institutes." Is IIMC that much behind A and B? A and B se call aane se raha.. C is my only hope in the big 3…. IIMC seniors say that IIMC is better than A and B in all aspects.. Can someone throw any light on this? The IIMB website has listed the names of its partner universities (around 100). Hope this may help some folks. Excellent Article.!! It’s really helpful to us.